A weak business environment, political instability and poor infrastructure quality are holding back economic activity in the Southern Neighbourhood. 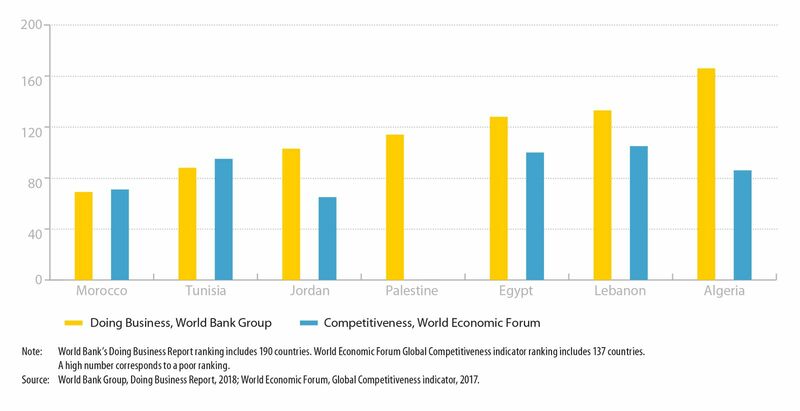 Competitiveness in the region is low (Figure 1), with many countries performing poorly according to the World Bank’s Doing Business 2018 report and the World Economic Forum’s (WEF) Global Competitiveness Index. The 2016 Enterprise Survey by the EBRD/EIB/World Bank Group identifies political instability, corruption, electricity shortfalls and access to finance as the top obstacles for private sector businesses in the region. The fragile political and security situation and the difficult business environment hamper private sector activity. They also hinder the implementation of complex projects, needed to address existing infrastructure gaps and within-country disparities. Many countries in the region suffer from poor infrastructure quality, as noted by the WEF Competitiveness Index 2017. The economic performance of the Southern Neighbourhood countries is slowly improving (Figure 2). The economies of the region expanded by 3.1% on average in 2017. GDP growth is expected to accelerate to 3.6% in 2018. The improving economic performance is supported by an improving security situation and the implementation of structural reforms in many countries, including Morocco, Tunisia and Egypt, according to the latest IMF Article IV Consultations for the countries in the region. Nonetheless, current growth may not be enough to substantially reduce high unemployment and address regional disparities within countries. The unemployment rate remained high, at 11.5% in 2017. Ongoing regional political tensions create substantial uncertainty for the private sector and continue to pose a substantial downside risk to the economic outlook of the region. The conflict in Syria has had a severe effect on Jordan and Lebanon. GDP growth is picking up slowly in both countries, reaching 2.5% in Jordan and 1.5% in Lebanon in 2018. 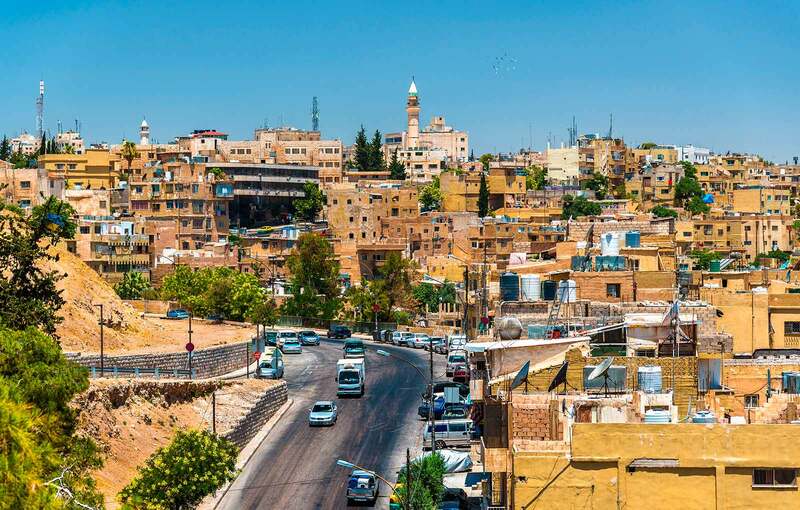 The fiscal position of many countries in the Southern Neighbourhood is vulnerable, despite notable fiscal consolidation efforts in Egypt, Jordan, Morocco and Tunisia. Fiscal deficits will remain above 5% of GDP in 2018 in five out of seven countries, according to the IMF (Figure 3). Moreover, debt to-GDP ratios will exceed 90% in Egypt, Jordan and Lebanon (Figure 4). The fiscal position in many countries suffers from the legacy of weak domestic revenue mobilisation and high current expenditures to support large public sectors. Low oil prices have contributed positively to the external balance of oil importers in the region. Nonetheless, all countries in the FEMIP region record current account deficits (Figure 5). Current account deficits are particularly pronounced in Lebanon, Palestine(2), Jordan and Tunisia. The large current account deficit in Algeria, a net exporter of oil, reflects low oil prices. Export competitiveness is challenged by appreciating real effective exchange rates that arise from the dollar pegs that are in place in some countries. Egypt, Lebanon and Jordan receive large remittance inflows, which help to finance their deficits. (2) This designation shall not be construed as recognition of a State of Palestine and is without prejudice to the individual positions of the EU Member States on this issue. The financial sector in the region is dominated by banks pursuing traditional business models. The percentage of firms with a bank loan is comparatively high in Lebanon, Morocco, and Tunisia, whereas Egypt, Jordan and Palestine are lagging behind as shown by data from the EBRD/EIB/World Bank MENA Enterprise Surveys (Figure 6). Banks dominate the financial system and are relatively large, supported by a solid deposit base. At the same time, a large share of deposits is invested in government debt. In some countries, the reliance on domestic banks for financing the fiscal deficit and public debt reduces the availability of credit for the private sector. Bank credit to the private sector is above 60% of GDP in Morocco, Tunisia and Lebanon, according to Fitch. However, lending to the private sector is often concentrated on a small number of large firms. This can exclude the vast majority of firms from access to bank lending, even if credit to the private sector is high. Non-bank financial institutions and capital markets are still at an early stage of development. Access to finance is a major obstacle to operations for 30% of SMEs, compared to 20% of larger firms, according to the EBRD/EIB/World Bank MENA Enterprise Survey. Moreover, while 73% of firms claim that they are not credit-constrained, 58% of these firms do not even apply for a loan with a bank (Figure 7). In practice, these firms are shutting themselves off from the formal financial sector and becoming disconnected. The MENA Enterprise Survey shows in fact that disconnected firms behave like firms that are credit-constrained when it comes to investment decisions. In other words, disconnected firms may have enough capital to operate but not enough to invest, expand and create new jobs. 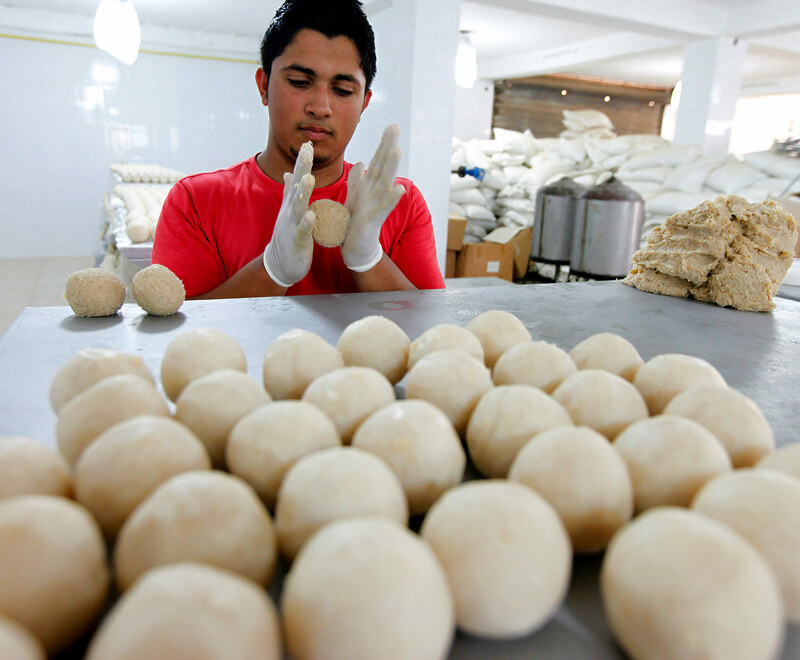 Inadequate access to finance and disconnectedness are especially pronounced for SMEs and microenterprises. In addition to the high concentration of lending to large firms in the region, the high cost of credit, reflecting stringent collateral requirements, and the inability of financial institutions to assess the risks of investing in SMEs are to blame. SMEs in their early stages find it very difficult to access bank finance due to their lack of credit history. The MENA Enterprise Survey shows that firms are less likely to disconnect from the banking sector and more likely to create new jobs if banks accept movable assets as collateral. Since a large share of firms’ assets consists of machinery and equipment, the willingness of banks to accept movable assets as collateral could go a long way towards enhancing access to finance for microenterprises and SMEs (MSMEs). In all countries, SME lending could benefit from reformed secured transaction frameworks and better credit information. Insufficient coverage of credit bureaus is amplified by the poor quality of financial reporting by firms.